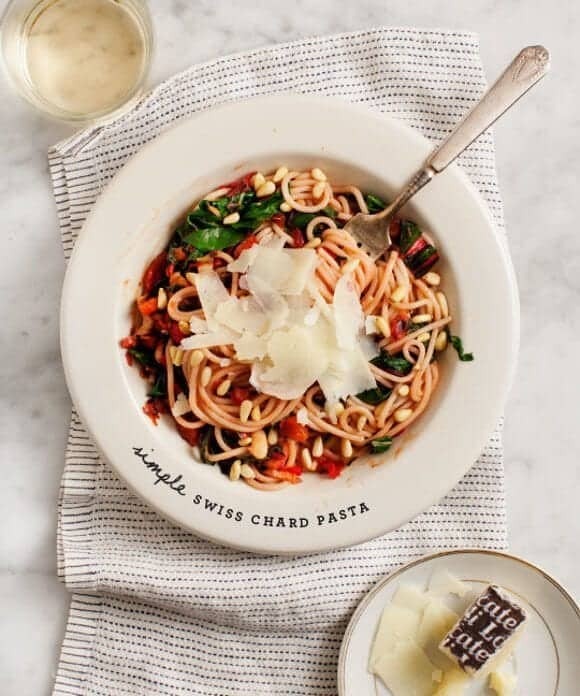 Swiss chard brings two textures to this yummy 20-minute pasta. The stems add crunch, while the leaves gently wilt into the white bean & tomato sauce. It doesn’t get much easier than this one. I’ll admit, I often get very veggie-happy. 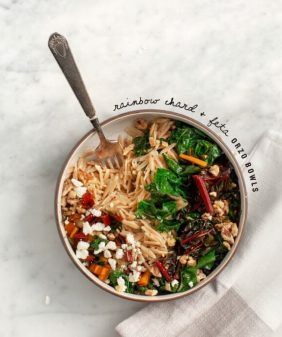 While I don’t mind chopping up a rainbow of vegetables – sometimes it’s more than ok to keep it simple and let just one ingredient be the star. 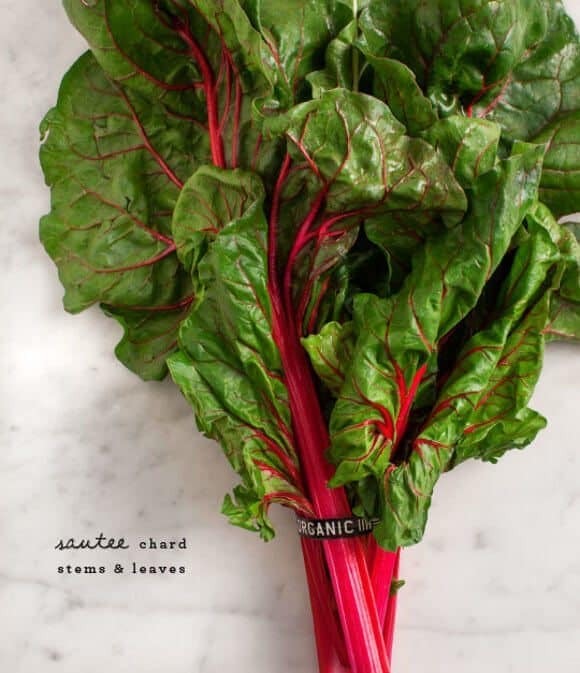 Last night, I chopped up this beautiful red chard and tossed it with a few simple pantry ingredients. Dinner was done in less than 20 minutes, and Jack and I were able to get right back to our House of Cards marathon. (Don’t tell me what happens, we’re only a few episodes in). Chard works especially well in a 1-vegetable meal because you get two textures in one. The stems lend a nice crunch and the greens softly wilt. I sautéed the chard with canned tomatoes and some white beans that I happened to have left over in my fridge. I topped it all with a few pine nuts (although chopped walnuts would be equally delicious), and a few generous shavings of pecorino. Super simple. This easy pasta dish comes together in just 20 minutes. Skip the cheese to make it vegan, and use gluten-free pasta to make it gluten-free. In a large pot of salted boiling water, cook pasta until al dente. Meanwhile, in a large skillet, heat oil over medium heat. Add chard stems and a pinch of salt. Give them a stir, then add the chard leaves and gently toss until they begin to wilt. Add the balsamic, tomatoes, garlic, white beans, freshly ground pepper, and toss. Once the chard is cooked down, add pasta and remove from heat. Serve with shaved pecorino cheese and pine nuts on top. You always make food seem so simple, fresh and satisfying. Love it! it really is so very important that meal prep doesn’t cut into netflix binge watching time! this looks delicious and it’s been a while since i’ve had chard. i just might have to work this into the rotation this week! Did you miss out the white beans in the ingredient list? This can also be done with kale, beet greens? thanks! Just fixed that… Yep, you can make this with kale or other greens. If you include chopped kale stems, I’d cook them a little longer than chard stems. Oh this is just beautiful! Swiss chard is really under utilized! I love the balsamic here, have you tried raspberry balsamic with greens – it’s heavenly! Pinning! I’m not sure if it’s the PNW but I haven’t seen Chard in the store for years! 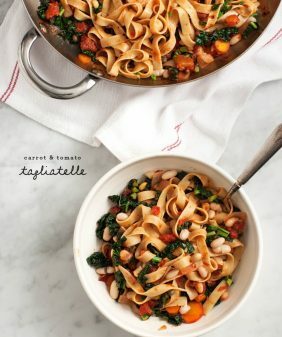 This looks so delicious; perfect for these winter/spring/in between months. And I absolutely love that you used fire-roasted tomatoes. So simple, but so smart. Looking at this dish makes me smile. 2 words came to mind, comfort and colorful, not to mention easy! Simple dinners that also double as healthy AND delicious are without a doubt, the best. This looks so simple and tasty! The next time I get Swiss chard from my farm share, I will definitely try this, post and rate. 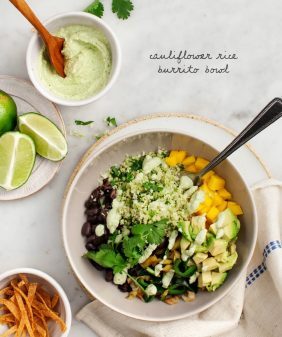 I love how you incorporated the beautiful stems – eating colorful plants is so healthy for us! Thanks for the recipe. This looks so delicious! I will have to give it a try! I think this looks delicious, but I have a weird textural aversion to any type of tomatoes except sundried. 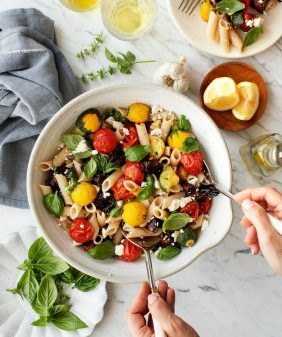 Is there any particular ingredient you would suggest to substitute for the tomatoes, or would you just recommend leaving them out? Yes! This is exactly the kind of dinner I make when I’m short on time and long on hunger. 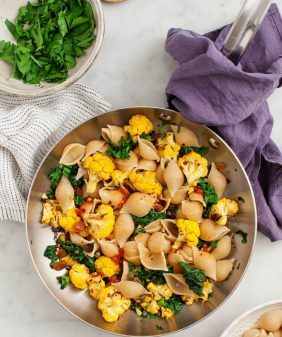 Pasta, greens, and cheese = hooray! This is just about the most perfect pasta dish I can think of. I like the less is more approach, definitely pays off! This is going on my to-made list! Delicious! I love your plate by the way ;)! This looks refreshing! Love the chard! Or put over quinoa! Yum. Organic swiss chard is all over my Whole Foods now. Thanks for the recipe. What a beautiful pasta recipe. I want to try this! I need new ways to use swiss chard. the garden. Tasty way to spot light this wonderful veggie. Thanks for the recipe! It’s really hard to find a decent one for swiss chard. If I don’t have beans on hand (and it would take too long to cook at this point, I’m starving! ), what would you recommend to add to the recipe instead of them? Hi Margaret – I would just skip them! I just happened to have some leftover which is the only reason I got the idea to include them. Made this for dinner tonight. Came together quickly and was delicious and beautiful! I love how simple and straightforward this is! I’ve been excitedly keeping an eye out for swiss chard in the markets but haven’t found it quite yet- can’t wait! I love this recipes , it looks delicious . It will be so helpful in my meal planning . 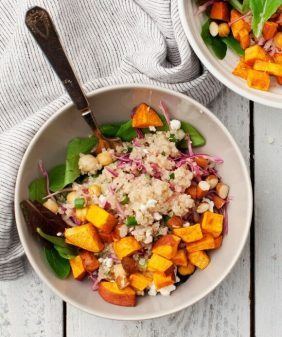 Thanks for this amazing healthy recipes. Thanks for this! I added a little goat cheese at the end to make the sauce a bit creamier for my husband, and it was amazing! Love goat cheese… What a great idea. I’m harvesting the largest rainbow chard leaves I’ve ever grown and having a craving for pasta so this comes at a good time…Do you add a bit of the pasta water to the sauce? Hi Louise, I don’t because the greens release a bit of water (and I don’t want it too watery). If you wanted to reserve some pasta water just in case – you could. What a beautiful pasta dish. This turned out wonderful! My meat eaters enjoyed, and finished the entire meal. No leftovers! Wow a first for a vegetarian dish for me. Wow! I was just trying to figure our what to do with some fresh chard. Googled and came to your recipe. I had all of the ingredients. Now this might be in the regular rotation. Thank you! Hi Lauren, I’m so glad you loved it!